The Cupcake Challenge goes for glory the day before the Super Bowl. drink | eat | play's Cupcake Challenge is back frosting up the Renaissance Hollywood on Saturday, Feb. 4. Salty-sweet is a flavor that's had plenty of buoyancy over the decades. But it has truly come into its own courtesy of the gourmet chocolate, sea-salted caramel craze of recent years. Will it soon be law that every dish must include a sea salt caramel version? We wonder. But, when the flavors are split in two, salty typically arrives first, then sweet; if you don't eat your meat you can't have any pudding, said Pink Floyd. 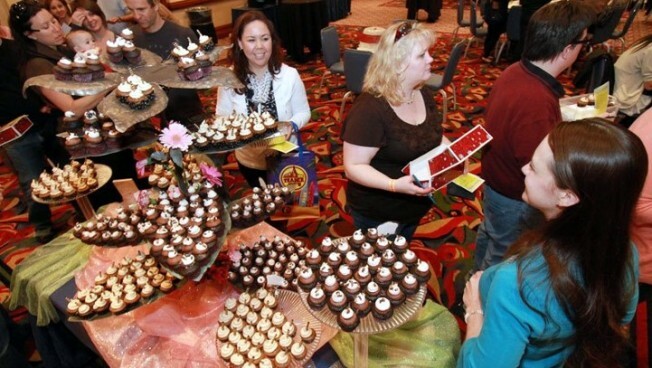 Which is one reason we like the offbeat timing of the annual Cupcake Challenge, which is set to unfurl at the Renaissance Hollywood on Saturday, Feb. 4. Saturday is all about the sugar. And then, on Sunday, you're free to salt it up all you like at your Super Bowl party. Chips, dips, pretzels, little hot dogs in fried dough. Sodium-a-rama. Sweet > salt, in short. Are you up to changing old patterns? Good. Then here are a few more need-to-knows: The Cupcake Challenge will sell out; it always does, and it is flirting with doing so now. drink | eat | play, the event's organizers, posted a few days back that only a third of the available tickets are left. Two? All sorts of top bakeries from OC and LA will be piling up the frosting-y gems. You'll have a wide selection. And three? Snacking on that wide selection will cost you $40. Nope, that isn't what you pay for a single cupcake at the local neighborhood bake sale, but the selection and setting are frankly swanker. Swanking up the cupcake on occasion never hurt anyone. So we started this all out by suggesting you'll go sweet on Saturday and then salty on Super Bowl home. But, let's be honest; some crafty baker at the Cupcake Challenge will probably create a salted-something cupcake. And will there be bacon atop some of the goodies? The savory strips have a way of popping up everywhere, even at sweets conventions. Oh, bacon. You constantly surprise and astound, in a way salty foodstuffs typically do not. Renaissance Hotel - LA Cupcake Challenge from dan silberstein on Vimeo.